Looking to save on your business’ telephone bills? Hosted business telephony could be the answer. This solution combines the best features of an on-site Private Branch Exchange (PBX) with the convenience of cloud-based VOIP technology. The result? A truly future-proof telephone system for South Yorkshire businesses. Hosted VOIP installation is easier than the name implies. We’ll handle the set-up procedure, while maintenance is included in your plan. One of the key benefits of hosted telephony is that most of the tech’s kept off site, so there’s less to go wrong at your end. 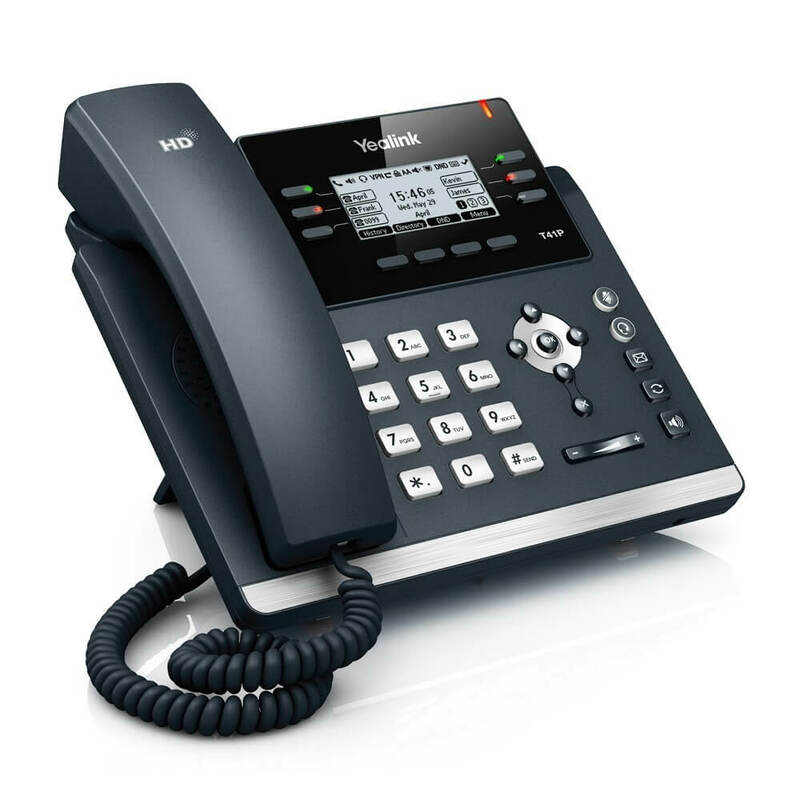 The Yealink T41P handset (*free with 3-year contracts) offers HD-quality sound along with a back-lit graphical LCD, soft-touch keys, speed dial and everything else you’d expect of an IP handset. Easily utilise advanced call features such as hunt groups (line hunting), conference calls, voicemail to email, call holding, call recording – and more. With hosted VOIP, being away from your office needn’t mean that you’re away from your business. This cloud-based system can be accessed on demand from anywhere on Earth; provided you have an internet connection, your hosted telephony system is at your disposal! For most businesses, this one’s the clincher… VOIP provides a range of cost-saving opportunities. For a start, because VOIP calls are routed via your existing broadband connection, there’s no need to install an additional line in order to increase your phone system’s capacity. Call costs are also reduced – our plans come complete with 2000 mobile and 2000 landline minutes. Learn more about how VOIP could benefit your business. Hosted telephony offers businesses a way to stay ahead of the curve and integrate VOIP technology into their operations. Choosing a hosted solution offers space-saving advantages, as well as saving the time and hassle associated with maintaining an on-site PBX. Traditional telephone systems rely on creating a direct link between the 2 parties during a call. VOIP uses the internet instead, routing digitised voice data between IP addresses. As a global network of linked devices, the internet offers the perfect platform for flexible call handling. Users are no longer bound by their location, and can access their phone systems remotely, on demand. At Stephenson’s IT Support Solutions, we’ve built a reputation as one of our region’s leading tech-support firms. Our South Yorkshire service area takes in Barnsley, Rotherham, Sheffield and Doncaster – and all surrounding areas. Whether you’re an existing customer or have just learned about our service, make us your choice for a professional VOIP installation in South Yorkshire. Contact us today to learn how hosted business telephony could work for your business. We’re happy to run through all the details – from explaining the set-up procedure to detailing the on-going plans. Just get in touch using the form below – or speak to us on 01226 971371.